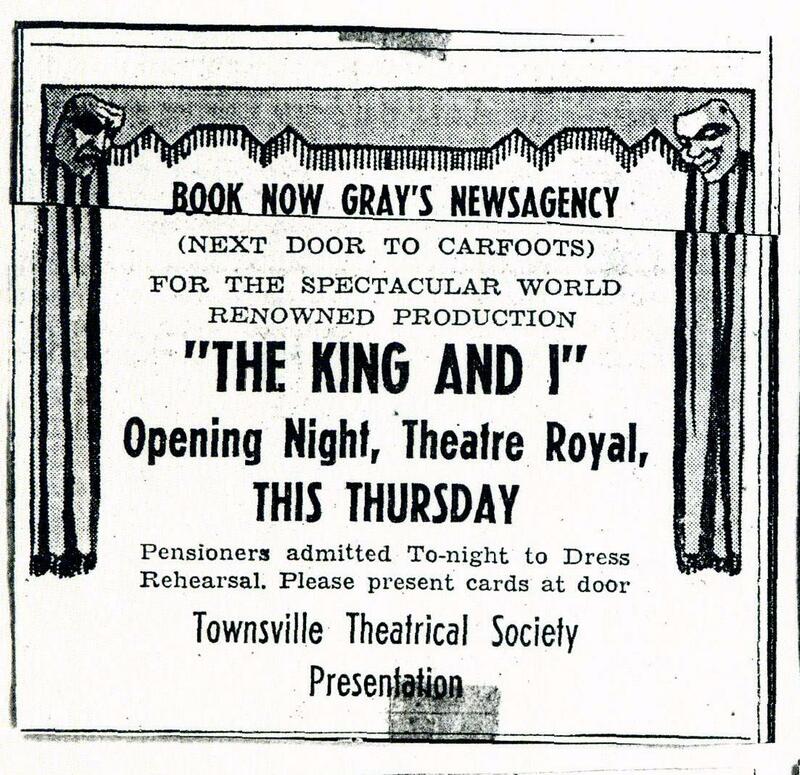 ‘The King and I’ was performed on the 10th May to Wed 16th May, 1962, at the Theatre Royal. Margaret Norton, Lynette Porter, Pauline Taylor, Kay Bonnett, Anne Reeves. Julie Meeson, Maria McFarlane, Jan Torkington, Lindie Ward. Mavis Colban, Freda Greske, Gary Hill, Bruce Shanks, Eddie Goon Chew. M. Sinclair, A. Doig, Miss J. Doig and Mr. D. Downey. Violins: L. BENSTED, B. BROWN, N. O'DEA, W. RIDDELL, C. CAREY, F. FEATHER. 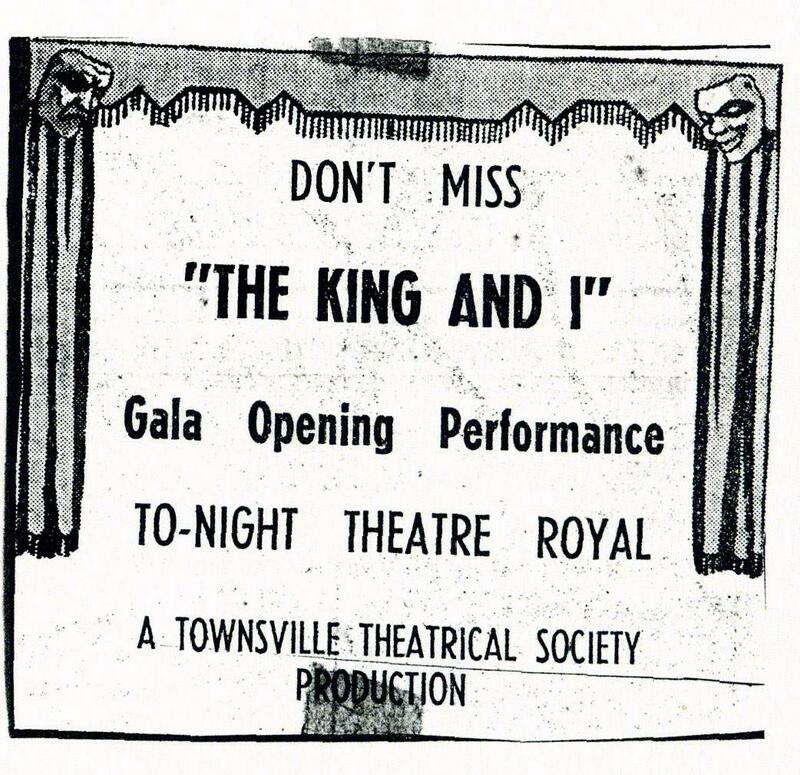 TOWNSVILLE.— This week's opening of "The King and I" marks the first musical comedy production ever attempted by a dramatic society in Townsville. It will be produced by Jack Grasso, who also plays the King. Anna is played by Betty Brown. Pianist is Russell Coxan with the orchestra conducted by Lilian Benstead. Choreography is by Ann Roberts. The production will run for six days, until Wednesday May 16.
tuneful music to make it a memorable show. There were few details left unattended in the Townsville Theatrical Society's colourful and ambitious production at the Theatre Royal last night. This must be one of the most successful and spectacular plays presented for some time in Townsville. Producer Jack Grasso deserves much praise for tackling the long and exacting musical, which, like most Rodgers and Hammerstein, has more subtlety than traditional musicals and even a bit of sermonising. "The King and I" was the first of their successes to exploit the Oriental atmosphere, and this production exploited it to the full. With settings, décor and costumes, especially costumes, it was always highly colourful, and sometimes enchanting in its effects. The "fairy-tale" atmosphere was also beautifully conveyed by exciting ballet and a charming chorus of children. But the subtlety was caught here too, with warm characterisation, par¬ticularly from Betty Brown as Anna. Hers was a sympathetic and often moving performance and she sang pleasantly and clearly. Always there was a fine balance between her petulance and pathos. As the King, Jack Grasso completely dominated the stage, as he was meant to. Moving and expressing him¬self well, he was handicapped at times by his accent and quick speech, but his com¬manding presence generally made amends. His "A Puzzlement" was eloquent and his polka delightfully funny. The young lovers, Lesley Wyer and Ray Campbell, sang their two lovely numbers splendidly. Lesley Wyer was a demure and pretty Tuptim with a sweet voice and clarity in the narration of the "Uncle Thomas" ballet. Ray Campbell lent his fine voice well to the part of Lun Tha. As Lady Thiang, Mary Summerfield both sang and acted well and also achieved a warm portrayal of her character. Ronald Stannett made an impressive appearance as the Crown Prince and made the most of his first-act entrance. Young Kenneth Brown had a strong voice and natural¬ness in his part as Anna's son and fully shared the polish of his elders. Glen Power, as Phra Alack, contributed his moments of comment effectively. Other speaking parts were well handled by Michael Lilwall, Alan Tealby, Barbara Mitchell and John Fox. The children were enchanting and the "wives" an attractive chorus, although they appeared rather hastily got together at the beginning of Act II. The small group who sang in the ballet sequences was particularly good. The dancers, led by Carol Jones and Gary Hill, were superbly dressed and highly efficient, and it was largely due to them that the long second act did not seem to drag at all. The orchestra had also had a large part to play and put up a spirited performance. Not only the catchy melodies, but the visual effects and all-round effort of this production will linger with those who see it. "The King and I” will be presented nightly until next Wednesday night.